Such a great post, Linda! I love Nancy's books too, and I can't wait to read this one! yea, she really captures the essence of people and their accomplishments. Our family tradition is to have stockings on Christmas morning. We are all grown up, but we still have our Santa stockings filled with fun little things. As for kindness at the holidays, I like to over tip and service staff. I try to make eye contact with people and give them at least a smile and hello no matter who they are, no matter their social status, we are all in this together. Seeing a person smile; their eyes light up, makes me smile even more. those are all good things, Sarah. I met Nancy at that WOW 2016 conference and found her to be so approachable and willing to share what she's learned in her writing journey. This book looks fabulous. This year I rang the Salvation Army kettle bells with a friend. It was so much fun speaking to the shoppers, giving them a smile, and wishing them them Merry Christmas. We have a special family Christmas Eve supper, using the fresh pears from a friend in a gourmet green salad. Congrats on a wonderful book! I can't wait to read it! I run an after school program with students where we decorate for holidays. I cannot wait to start working on A Kind Holiday-what a fantastic message for everyone! Hi "unknown". Thanks for your comment. Can you give me at least a first name to enter you into the giveaway? What a fascinating story! I'm intrigued to find out more. We always have a real tree with lit candles in the German tradition. It looks magical and is really special. For us, Christmas is about family and thinking of others. Good luck with the book! Thank you Linda for this wonderful interview. Nancy has given so much by example to aspiring NF writers like me. This book sounds wonderful. I am fond of our family tradition of making home-made egg rolls for our Christmas dinner. My kids, now grown, always want a huge egg-roll feast when we have holiday gatherings. It becomes an assembly line process, and we judge each 'rollers' skills as the rolls come out fried crispy and brown.... but not always so round. that sounds like fun, Damon. This book looks like it's right up my alley. I can't wait to read it. I think teachers and librarians will love this one with its message of kindness! 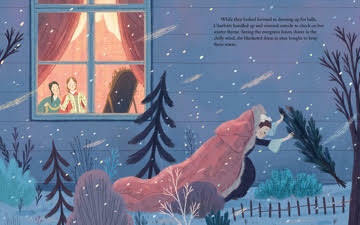 An intriguing story with enchanting illustrations, already on my wish list! My tradition is to splurge on unique (nothing mass produced in China) dog and rabbit ornaments for my tiny Xmas tree--I have rescued dogs and rabbits and volunteer with them @ my local SPCA. But now I need to find one of a chinchilla as I adopted Daffodil from a chin rescue! This book sounds wonderful. It's amazing how many things we don't know! I can't wait to read it. Thanks. Terrific interview. I'm looking forward to reading this one! My son no longer lives at home and we always spend Christmas with my parents (about six hours away), so we've stopped putting up a tree since we're not really home for the holiday. But a favorite new tradition has come out of this—we decorate my antique dressmaker's dummy. She gets mini-lights and tinsel and a few ornaments and we put presents under her. It's so much easier than bringing out all the tree decorations and I love the way it looks! that certainly is unique and interesting. Loved learning more about this book. My principles don’t allow me to talk about the kindnesses I do, or it smudges them up, so I’ll just say I keep a lot of ten dollar bills handy all month and make sure they go where needed most. Part of my heritage is Germanic which means my Grandma's fingerklatzen cookie recipe is one of the must make holiday treats. We all have that one cookie that is an absolute MUST for baking during the holidays. Thanks for sharing, Wendy. Oh, my goodness! I love the story behind the story...how it started off being a story about the tree and turned into a story about Charlotte. What a journey! Wow! yes, isn't it interesting how stories can gradually morph from original idea through draft after draft. Sometimes the story that needs to be told just makes itself known. Thank you, Linda for an excellent interview with Nancy Churnin. 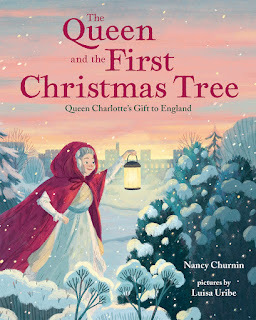 I've read all of Nancy's picture books and look forward to reading THE QUEEN AND THE FIRST CHRISTMAS TREE. yes, Suzy. I first heard of Nancy when her first book about William Hoy was published and have followed her ever since. I have my copy of this book ordered and can't wait until it arrives. P. S. Our Christmas tradition is an Italian spaghetti meal with veggie balls [for those who eat a plant based diet], meatballs, and sausage. A garden salad, homemade bread, and of course, sugar cookies for dessert. that's the first I've heard of spaghetti for Christmas but...why not? Who doesn't like spaghetti? I love this story! So brilliant to write a nonfiction christmas book of this sort. The christmas traditions we are enjoying with our children: icky sticky ooey gooey buns for breakfast (aka monkey bread - I don't think the kids like it as much as we do but it's a tradition!) and gingerbread houses from scratch - yum! I bet the kids loved that (and the parents probably appreciated it as well). And enjoy your monkey bread. Sounds like another great book from Nancy Churnin. My two favorite family Christmas traditions growing up were listening to the Dolly Parton & Kenny Rogers Christmas album and making chocolate covered pretzels. 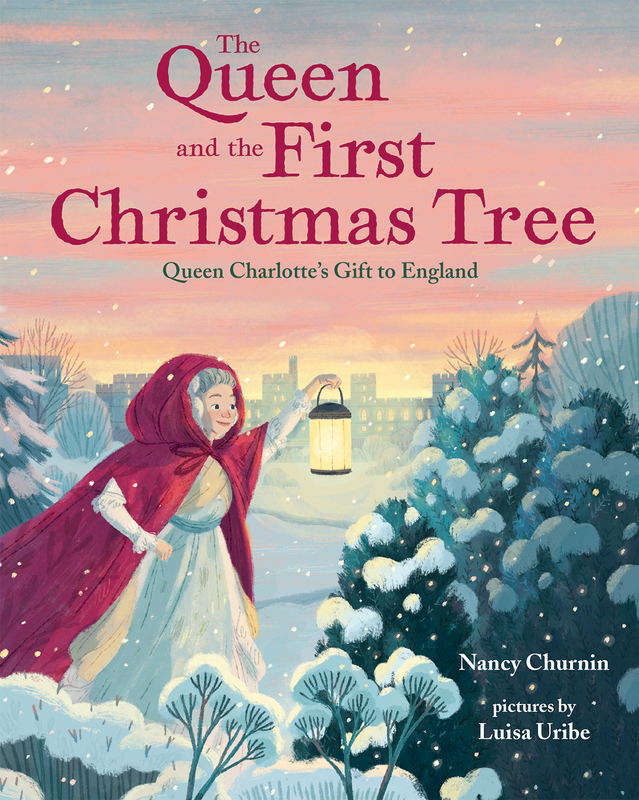 Nancy, Your journey to publication of this book, and then finding its heart in Charlotte's kindness, are an inspiration to all of us who are researching other fascinating persons for picture book biographies. Thank you for lifting your light for us!